Problem "What should I eat today?" is an everlasting question we all have. It is so easy but difficult to answer. Challenge Most food related services were focused on introducing restaurants rather than meals. Users often ended up ordering the same food all the time. Solution Created an app that introduces new meals and helps users pick one. 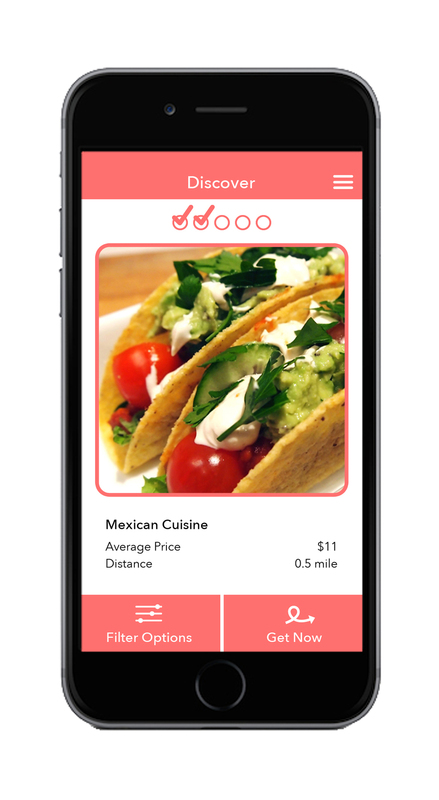 With this app, users are more likely to try new meals they haven't tried before. Note: This is a project that was first created at the Startup Weekend NYC event. Three out of four members continued working on the project, developing it into a fully functional mobile application. My role in this team was the UI/UX Designer. So what should we eat for dinner? It’s funny how difficult it is to actually make a decision on this simple problem we encounter every single day. It takes a minimum of 20 minutes or more to decide, especially when I’m hanging out with my friends. We’ve tried literally numbering a few restaurants and rolling a dice, but there must be a better solution. That is how we have come up with Food Loop. Food Loop is a mobile app that will help users decide on what meal to eat. Users still get to make the decisions based on preferences, but there is also some randomness that turns it into a fun opportunity to find new restaurants. More importantly, it is quick and easy. Based on the user’s filter preferences, a number of dishes are presented by photos. The only information viewable with the photo is the food type, price and distance away. Users do not get to know which restaurant the dish is from. This is where the swipe interaction, familiar from Tinder, comes in for action. By viewing the photos, users can swipe the food to the right if interested, and left if not. The photos that are swiped right will create a list that users can view again in the next stage. This is where the users get to see the details of the dishes and restaurants. This list can be used to decide what to eat immediately or it can also be an archive for restaurants that the users have visited and would like to tryout next. 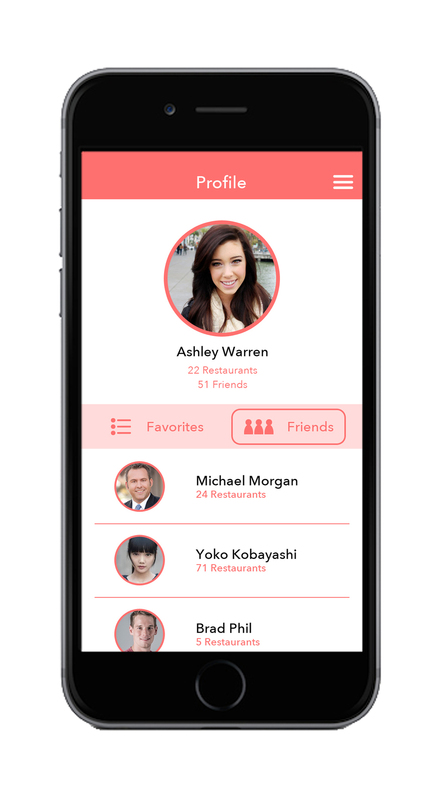 Users can also write down notes for each restaurant. Once a decision is made, there are action buttons, which allows users to make reservations or order delivery. The social media aspect of the app is still in need for more work and could be further developed in the future. 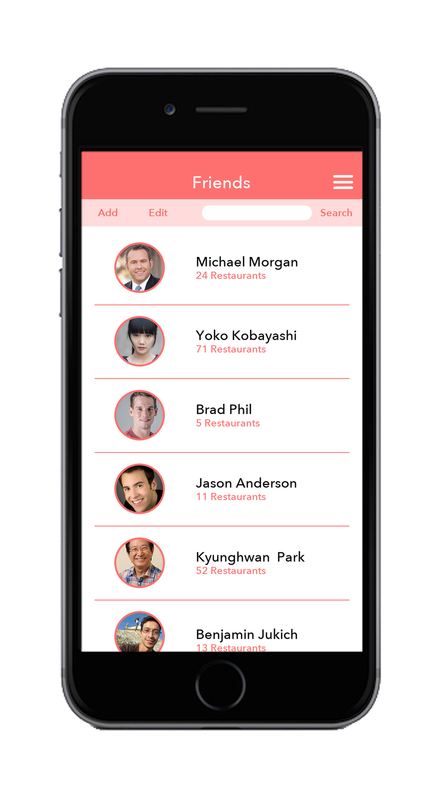 Users can view friend’s lists and share meal recommendations. There could also be rewards for receiving many right swipes on a photo that a user uploaded. This will encourage more and more users to upload photos of meals in the database.